Stunning Photos Depict Migrants 'As They'd Rather Be Seen' : Goats and Soda The photos avoid war, destruction and poverty — and instead focus on the beauty and resilience of people who leave home in search of a better life. 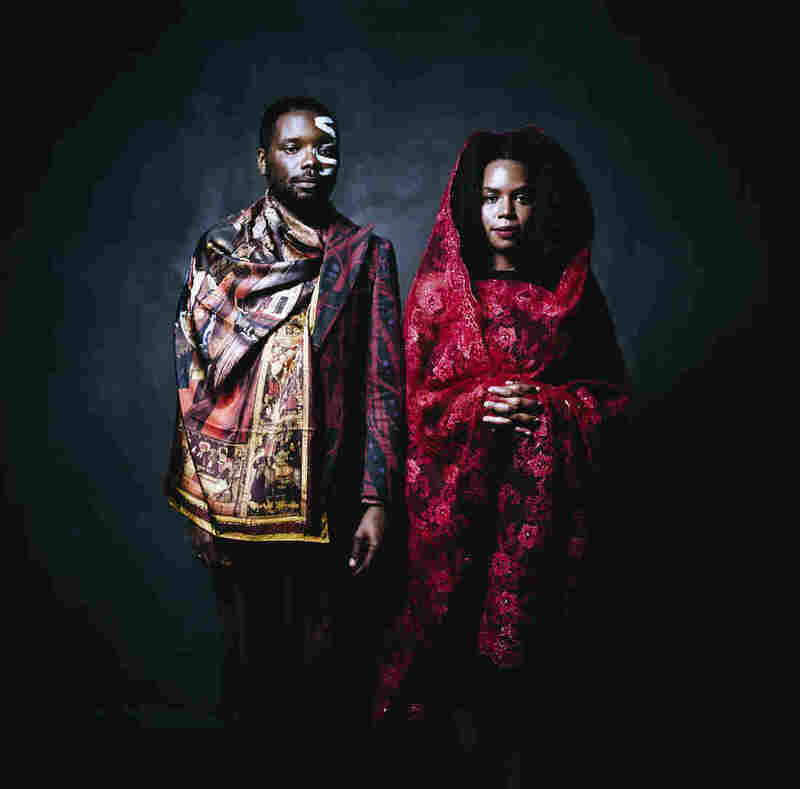 James Jean and Patrice Worthy, photographed in New York City. They model clothing by Ikiré Jones. Curated by the Open Society Foundations, a philanthropic organization founded by George Soros, the exhibit is the latest installation of its annual Moving Walls series. The series is dedicated to social justice, and this year, the topic is migration. The show opened on September 26 at the group's office in New York City and runs until July 2019. The Foundation received more than 400 submissions and chose 13 photographers, artists and storytellers. Many of the winners are immigrants, migrants or refugees themselves. "We aim to emphasize the individual acts of bravery and self-sacrifice as well as the resilience of familial and community ties that exist amidst stories of great risk and pain," said co-curator Yukiko Yamagata in a statement. One activist photographed a Mexican immigrant among colorful handcrafted piñatas, which she sells to support her family in Queens. A designer traveled to Italy to cast African migrants in a high-end fashion shoot. 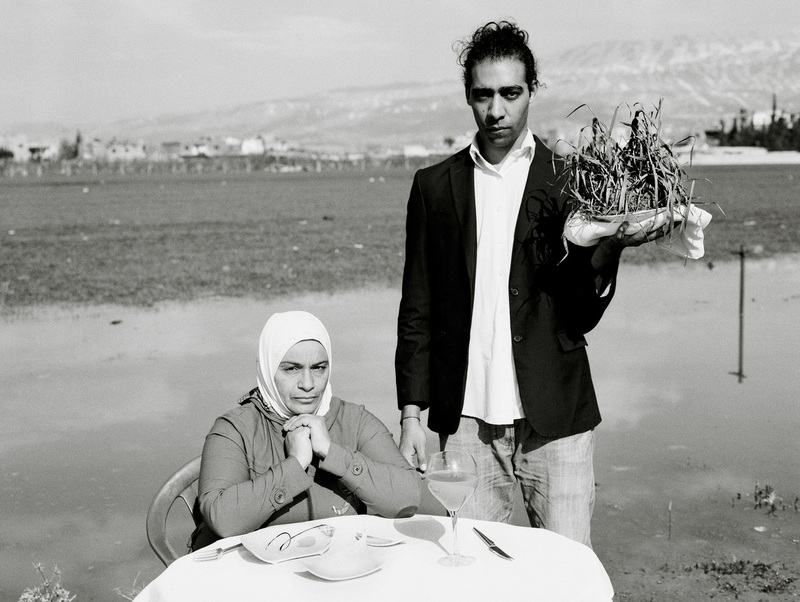 A photographer asked a refugee family in Lebanon to re-create a tough moment: serving the children grass, because there was nothing else to eat. Each artist will receive up to $60,000 from the Foundations to continue their work. Here's a sampling of the art and photography. 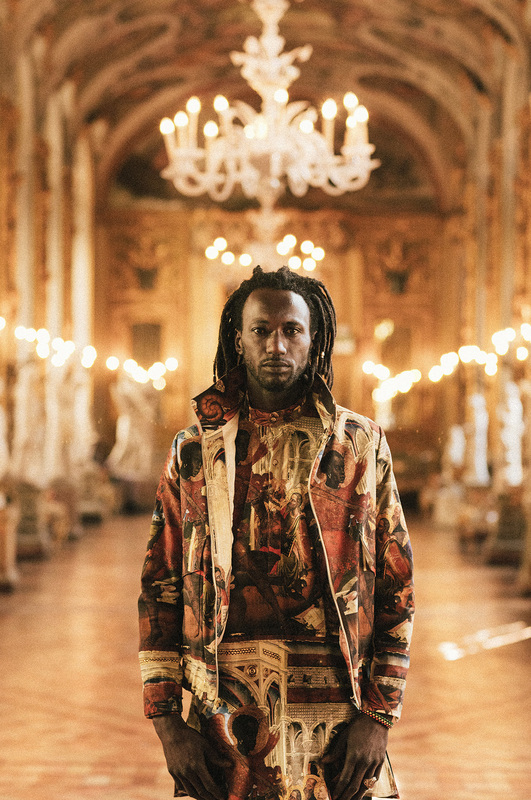 Ousman Pa Manneh, originally from Gambia, models clothing by Ikiré Jones in Rome. "No matter how beautifully we are dressed," he said, "we are considered a threat." Walé Oyéjidé is the designer behind Ikiré Jones, an African-inspired fashion label, and helped work on the wardrobe of Black Panther. He immigrated to the U.S. from Nigeria in his teens. In a photo series called After Migration, he turned to an unlikely source for his models: African migrants. He says he told them, "You are beautiful. How can I show you as you'd rather be seen?" He worked with local nonprofit groups in New York City, Rome and Florence to cast migrants from countries like Gambia, Guinea and Nigeria. He says he paid them the same rate as professional models: a couple of hundred dollars a day. "Many had the same reaction that you and I would have" to being cast, he says. " 'Oh, you think I'm good-looking?' It puts a smile on your face." A public mural in New Brunswick, N.J., made by Layqa Nuna Yawar in collaboration with the Esperanza Neighborhood Project. Layqa Nuna Yawar is a muralist based in New Jersey. He moved to the U.S. from Ecuador at age 14. He now travels the world painting murals in collaboration with migrant and immigrant communities and low-income populations. 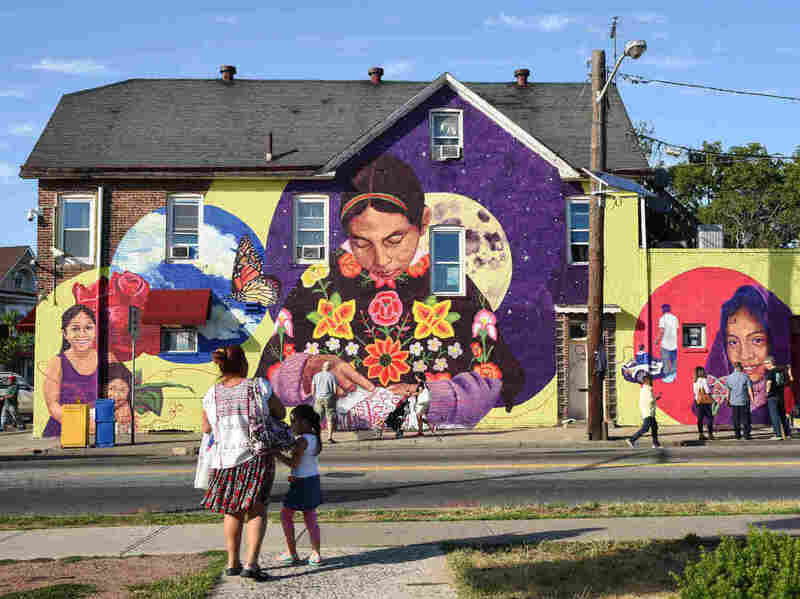 This year, he teamed up with an organization called the Esperanza Neighborhood Project in New Brunswick, N.J., to create a mural representing mothers from Oaxaca, Mexico, in the community. For inspiration, he asked members to share their ideas. One told him, "I want a rainbow bridge to show we can keep families together." Others shared their dreams: "I want to make my mom happy," and "My son is my dream." Yawar wove all their ideas together into the final piece: An indigenous woman embroidering a traditional Oaxacan fabric. "Threads," he says, "keeping families together." A portrait of Valeria Reyes among her handcrafted piñatas. Originally from Mexico, Reyes is a member of the group Mujeres en Movimiento, which explores the use of dance, art, ancestral remedies and civic engagement to empower Latina immigrant women in Corona, Queens. Sol Aramendi, from Argentina, has been working with Latina immigrants in New York City since 2003. Her organization, Project Luz, organizes art and photography workshops to encourage women to tell their stories — and gain the confidence to call America their home. "I want them to start thinking of themselves as artists, with their dance, arts and crafts," she says. "I want them to think, 'We have rights, we work here. The streets are ours. We deserve to have an opinion.' "
Valeria Reyes, one of the women she photographed, is from Mexico and lives in Queens with her family. 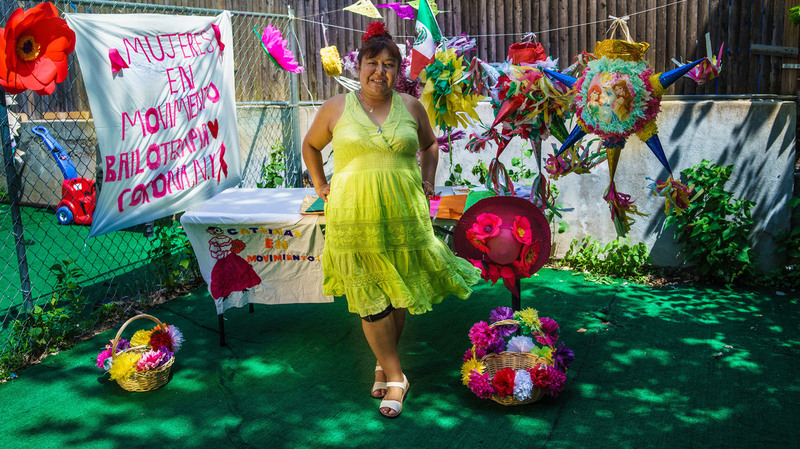 After her boyfriend abandoned her and left her without money, she started making and selling piñatas. Creating these handicrafts made Reyes feel something deep. "I'm practicing my culture and traditions, even though I'm in this country," she says. 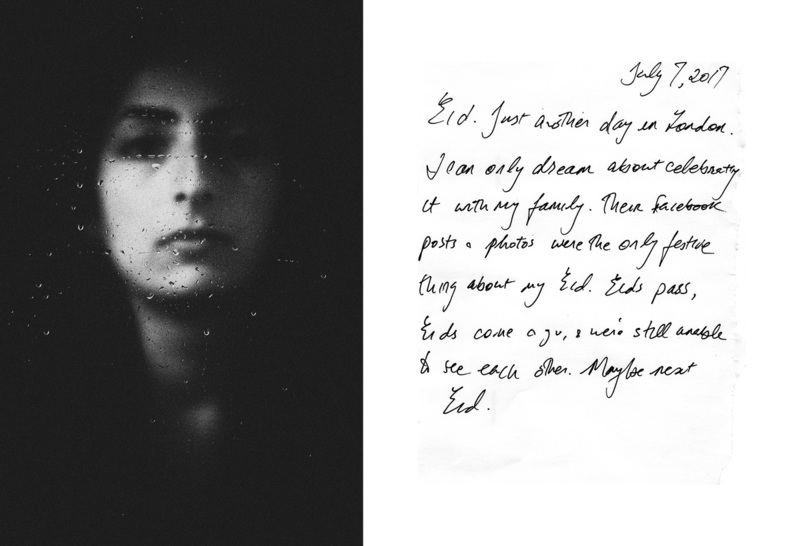 A portrait of Yasmeen, a writer and blogger from Gaza currently living in the United Kingdom, and a handwritten letter addressed to the artist, Thana Faroq. In the letter, Yasmeen describes her experience of seeking shelter in Europe. Thana Faroq is a Yemeni refugee living in the Netherlands. Her project, The Passport, documents "the people who would cross oceans and land masses to obtain a passport that will guarantee them a higher value in life," she said in an audio statement. She could not attend the opening event in New York because her visa was denied, according to the Foundations. In addition to capturing everyday moments of a refugee's life — the window of her room at the camp, chalkboard drawings made by refugee children on the asphalt — she asked some of her subjects to write letters. She wanted refugees to "be the authors of their own stories, to be willing to express their own feelings," she said in the statement. 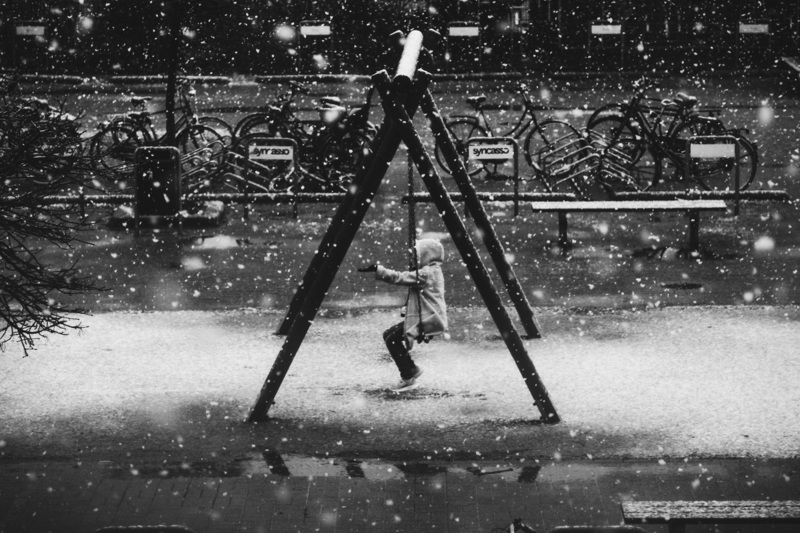 A young girl in a refugee camp witnesses snowfall for the first time in her life in Utrecht, Netherlands in December 2017. A replica of the Statue of Liberty is displayed on the front porch of a house in Intipucá, El Salvador. Its residents once lived in the United States. Jessica Ávalos, Koral Carballo and Anita Pouchard Serra want to show what migration looks like from the perspective of the home country. 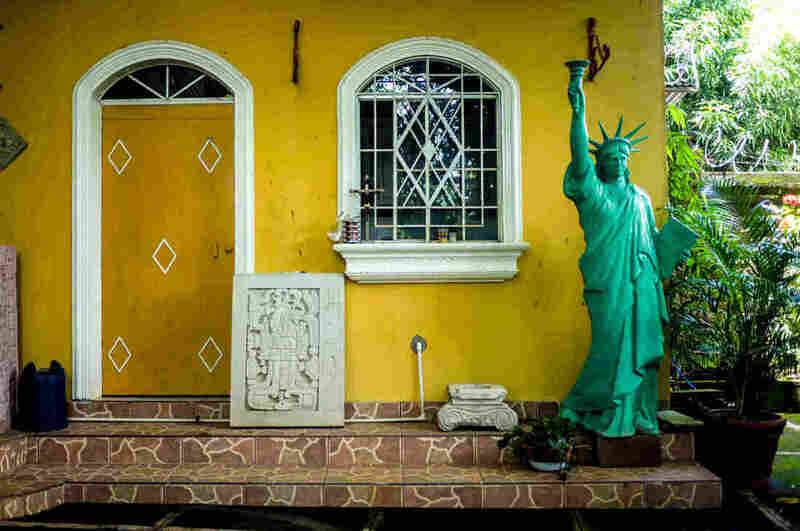 So they documented life in Intipucá, El Salvador, where residents have been emigrating to the U.S. for decades. "The people are very proud [of the migrants]," says Carballo. There's even a statue in the town square which, according to town folklore, commemorates the country's first migrant to America, who left Intipucá in the 1960s. Signs of the town's ties to America are everywhere — ads for Salvarodan businesses in Maryland in the stadium, a mural of the New York City skyline in one home, a replica of the Statue of Liberty on a front porch. "They feel a part of America because their family lives there," says Ávalos. "It's an example of how one culture can affect another." A portrait of Claudia Rivera, left, and a hand-written diagram of her family tree. 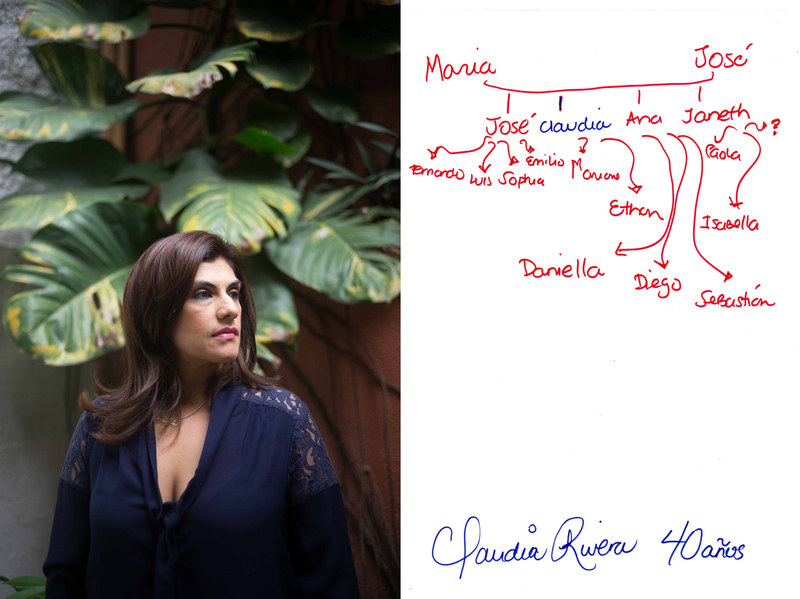 The names in red indicate family members who live in the United States, and those in blue live in El Salvador. Rivera, a doctor, once lived in the U.S., too. She and her family immigrated there in 1983 to escape the civil war. After many years, she decided to return to El Salvador. Amenah, 41, and her family faced hunger during the siege of Yarmouk Camp in southern Damascus in 2013. "There was only grass, but I couldn't pass it through my throat," she said. "Yet I forced myself to swallow in front of the children so they would accept it as food." She now lives in the Bekaa Valley Camp, Lebanon. Omar Imam is a Syrian artist based in Amsterdam. 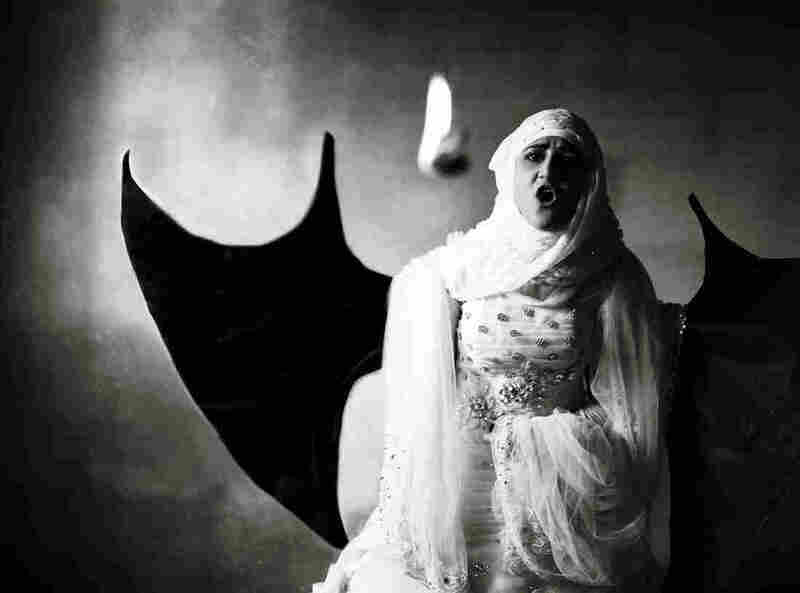 In his project, Live, Love, Refugee, he collaborated with Syrian refugees across Lebanon to re-create their dreams of escape, love and terror in a series of staged images. Props include balloons, a magician costume and dragon wings. Like Faroq, he could not attend the event in New York because his visa was denied. So he sent a voice memo, saying: "Google Syria or Syrians, you will find billions of results ... It's always the destruction, blood, rubble, boats and dead kids." Instead, he wanted to focus on "the inspiring, surviving attitude." In his artist statement, Imam said he hoped that the project would give his subjects a sense "of catharsis." In one photo, a woman named Amenah is seated at a table set with silverware and a white tablecloth. A man is serving her a bundle of grass. The reenactment plays on a hellish memory at Yarmouk, a camp in southern Damascus: "We had to eat grass," she told Imam. "I forced myself to swallow in front of the children so they would accept it as food." Kawthar, 16, says she was beaten and raped on her wedding night after being married to a 32-year-old Syrian man from a nearby refugee camp. "I wish to become a dragon and burn the scarves and everything in that tent," she said.